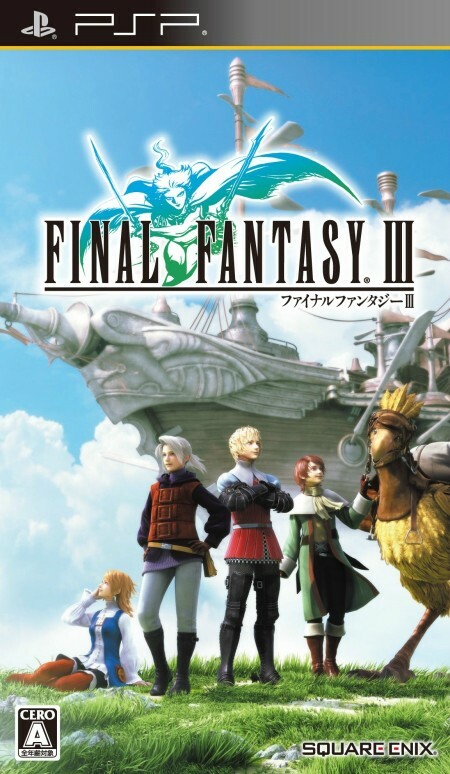 Did you know that Final Fantasy III will soon see another release? Granted, it's based on the rather underwhelming (in my opinion, of course) DS and iOS remakes of the vaunted series' third title, and it's about as likely to hit store shelves in the States as, say, the Wii version of Dragon Quest X (that one was a low blow, I know) due to it being a PSP game, but it's still worth paying attention to--if only for its colorful box art. 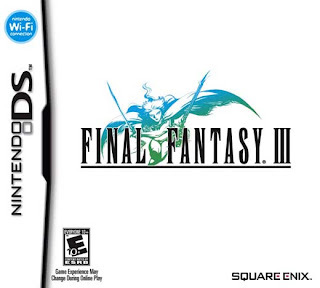 Compare that to the covers of the DS versions (the first appeared on European and Japanese copies of Final Fantasy III, while the second appeared on North America copies), which can be viewed below. If I were to award medals--we are in the middle of the Olympics, after all--to three of these four illustrations, I'd probably give the European/Japanese DS box art gold, the Famicom one silver and the PSP one bronze. Do you agree, or would you award your imaginary medals in a different order? Well, the NA one is so bland, it would fall out of the medal count for me. I'll probably go gold with the PSP though. The other two I'm sort of split on. Although I do really like the PSP one and think it looks cute, I reject any box art that isn't just the logo with the white background. Each Final Fantasy is so unique and different, its impossible to sum up, so I like the Amano illustrations curling around the words 'Final Fantasy' with the passionate colours. I do agree the DS remake of III was pretty underwhelming. I really like the classic simplicity of the title with the white background with FF games. Always have, always will. Yéti: Great choice! I've always loved this cover -- and the cover produced for the first Final Fantasy. Ah, Justin, why does it not surprise me that you decided to throw a wrench into the works? ;) That said, I, too, like the PSP cover art, and for pretty much the same reasons you like it. Hey there, Chalgyr! Fair enough. I don't think you can go wrong with any of these covers, to tell you the truth, although I, too, find the US DS iteration to be boring. The rest are great, though! Josef: That's an interesting stance to take. Are you European, by chance? 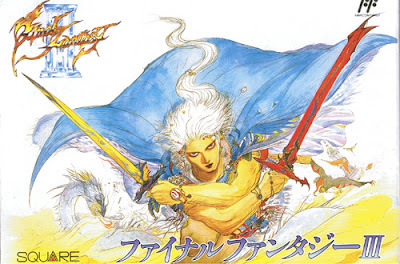 I ask because as far as I know all of your Final Fantasy games (or at least most of them) have been released with white cover art that features just the logo and an Amano drawing, right? Anyway, I don't dislike that approach, but I do personally find the other approach -- which involves some sort of illustration taking up the rest of the cover art -- to be more interesting. Really, though, in this kind of case, it's definitely "to each his or her own," if you ask me! Thanks for the comment, Alois! Well, it seems this edition of 'Which Box Art is Better?' is a really mixed bag. I love it! I normally prefer the white-with-logo covers, but both of those Amano illustrations are absolutely beautiful. I think I like the DS one best, but only just. The PSP cover is rather forgettable IMO. Hello Kimimi! I wonder if you find the PSP cover to be forgettable because it's CG rather than a drawing? That was my first impression, too, to tell you the truth. 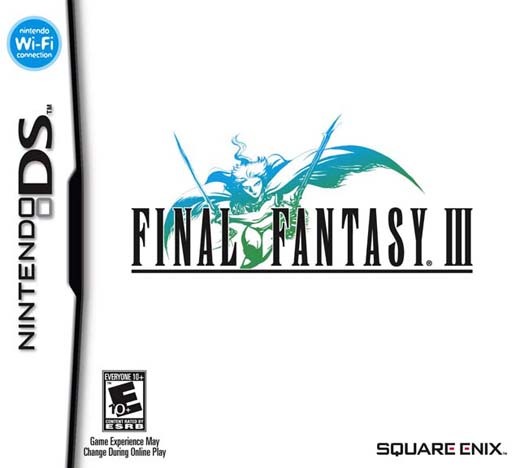 Still, I prefer it to the white-with-logo covers -- but I wonder if that's partially because I'm just not used to such covers (FF III DS is one of the first white-with-logo covers we've received in the US, if I'm not mistaken)? I just feel that the Amano drawings are perfect for illustrating the mood of the game whilst at the same time exhibiting a feeling of mysticism and leaving you wanting to know more. When there is other stuff on the box art my problem with it is that it defuncts the point of the logo. Thanks for clarifying, Josef! And like I said earlier, I think your explanation is an interesting one. I've always liked Amano's illustrations -- especially the ones that surround each Final Fantasy's logo -- so I can see preferring cover art that focuses on those illustrations and doesn't dilute them. That might be it - I think that sort of CG is fine in game but it doesn't make for a very emotive cover or enticing cover, it's just a group of people standing about. I think the plain white covers make quite a statement,it's almost like they're saying "You know exactly what this is, we don't need to tell you anything other than what's inside the box". I thinkit makes them quite brave and striking. Yeah, I agree, Kimimi -- with both of your comments! Especially the first one, though -- about the CG art not making for a very emotive or enticing cover. I actually made some sense? Yay! Always hated the CGI box art of the US Final Fantasy games. Unfortunately the much better European box art was the only good thing about the PAL releases had over the US ones. Therefore I'm voting for the DS EU and US version. The Japanese DS one is definitely my favourite, and the US DS one looks a little too boring for my tastes, but beyond that it gets a little muddy for me. I like the composition and general feel of the PSP cover, but I generally kind of hate the use of CG on covers - I'll take a beautifully handpainted illustration over that any day. On the flipside, what speaks against the Famicom box in my mind is the strangely gaudy colours, as well as that truly awful "Final Fantasy III" logo. I think the composition is a bit lacking too with the blank white background and those monsters(?) kind of squeezed into the corners. 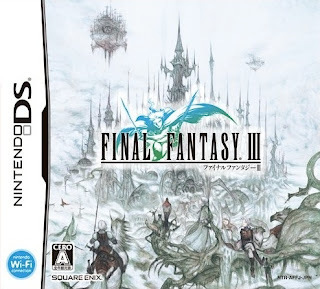 Overall, I like the way this illustration was incorporated in the modern FF3 logo way batter than I like the actual original cover. Let me add my two cents to this hot debate! I'm going to start off by saying that I don't really find any of the all *that* appealing. Actually it's funny that the US DS version just has the logo – I remember just the other day I was telling someone (it might've been you!) how I wished we got more of the plain FF game covers with just the logo like Japan. This time the US is the one to get just the logo, and Japan has the busy cover. Hmmm! This is a tough choice... I like the colors best on the original Famicom box, but I guess the Japanese DS one has the best overall aesthetic... I do like the PSP version because it's colorful, but I don't think the art is particularly memorable, so I'm not really that big a fan of it. Okay, I guess I'll have to agree with you – the Japanese/EU DS cover is the best! Hello again, Anne! Hmm, I don't know if you had that conversation with me or not. I can't remember! Still, it sounds familiar, so let's just pretend we *did* have that conversation. Given that, I'm surprised you didn't pick the US DS cover as your favorite. Why is that? 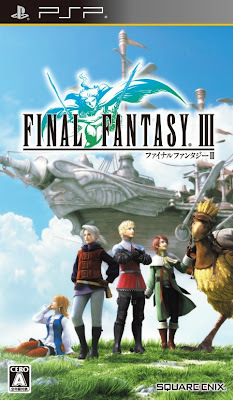 Do you not like this game's logo as much as some other FF logos? I really like the Japanese DS cover, BTW, although I'll admit that the Amano illustration that appears on it isn't among my favorites. Still, I like the 'feeling' of it, you know?